We all want that super smooth tone, with singing sustain, that makes our guitar sound huge and impressive. Not all pedals, nor amps, can do that and itâ€™s certainly a challenge to achieve something like that on a typical bedroom setup. The CostaLab Bad Angel promise to deliver classic amp distortion, with no compromise. Hereâ€™s my review. My first love, when it comes to pedals, was the green Sovtek Big Muff pi. My second love, and equally long lasting, was the the Rat. I bought the â€œVintageâ€ model back in the mid 90s and it completely changed my tone and shaped the sound of early Airbag. I still use it, or similar sounding clones, just for that saturated, smooth distortion. Fuzz and Big Muffs might be more unique in the way that they have a distinct tone and, they allow some really cool experimentation and wild sounds. Amp distortion, or distortion pedals, often leave more up to the guitarist but once you learn how to master it, you can get some extremely versatile tones that can take your tone and playing to new heights. Italian company CostaLab has designed some of my favourite pedals, including the Chorus Lab – an excellent version of the Boss CE2. The Bad Angel is one of their newest pedals and although not perhaps the typical Gilmour pedal, I wanted to check it out, mainly because I know how versatile a Rat can be and Iâ€™m sure many of you also have one, or something similar, in your Gilmour rig. The Bad Angel is housed in an MXR-ish box, with true bypass switching, bright leds and it runs on 9V negative tip adapter. The pedal sports three controls: gain, tone (clockwise) and volume. A push/push knob engages a second gain stage, adding more gain, saturation and harmonics. 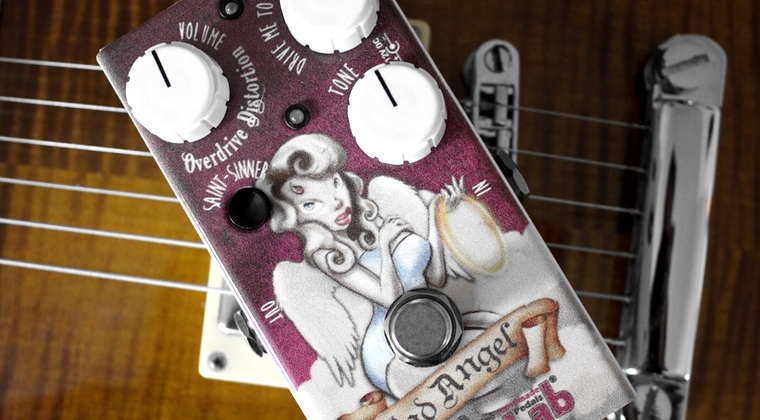 Strangely decorated with a 50s rockabilly theme, the Bad Angel has nothing to do with twangy tones and spring reverb. As mentioned, the idea sprung from the Rat and its amp-like distortion. In default mode, the Bad Angel act as a low gain amp or overdrive pedal, with a sweep from fairly clean, or slightly crunchy depending on your pickups and headroom, to pretty hot, similar to the Fulltone OCD. The Bad Angel responds extremely well to your playing and cleans up nicely when you roll back the guitar volume. Unlike the OCD and Rat, which both tend to sound a tad boxy and even lack some of the low end, the Bad Angel has more emphasis on the lower mid range, which makes it sound open but with a chunky attack (much like boosting the SPC on the EMG DG20s). The low end is nicely balanced, making the pedal an excellent and versatile overdrive unit equally capable of defined chords and fat bluesy leads. Engaging the â€œsaint sinnerâ€ mode, adds a second clipping stage and takes the Bad Angel into lead territory, much like boosting a cranked overdrive. Most Rat clones with a similar feature, often sound too aggressive or too muddy with more gain, but the Bad Angel manages to maintain that open and dynamic tone, even with the gain cranked beyond whatâ€™s healthy. While some distortions often sound thinner, and even a bit harsh, the more you crank the gain, the Bad Angel behaves much like a hot tube amp. The more you increase the gain, the smoother it gets. And likewise, as you turn the tone control past noon, it getâ€™s a nice subtle compression, which allow you to get a nice high end, without it ever sounding ice-picky. In terms of David Gilmourâ€™s tones, I find it capable of replicating the Tube Driver and G2 particularly well. It can also do a convincing ramâ€™s head Muff, with the â€œsaint-sinnerâ€ engaged and the tone up past noon for more harmonics. Although the similarities to the Rat are obvious, itâ€™s really not a fair comparison. The Bad Angel offer a new take on the classic distortion circuit and the wide range of tones and dynamics you get with this thing is very different from the Rat. The Pete Cornish G2, or similar clones like the TopTone DG2 and Buffalo FX Evolution, is perhaps closer, although these have more of that Muff character. Bedroom-wise the Bad Angel holds up very well and seem to work nicely on different sounding low wattage amps. Itâ€™s quiet and itâ€™s not depending on high volume or boosters to sound big. I donâ€™t have anything major to put my finger on really. I would have preferred the â€œsaint-sinnerâ€ as a second stomp switch so that I donâ€™t need to bend down for switching between overdrive and distortion. Check out costalab.com for more details. Thanks for the review. One popped up locally, and I decided to grab it after checking out your review and clip. I’ve put it through a couple of different amps, and compared it directly to my 90s RI big box The Rat. I find it to simply be a re-eqing of the Rat with a button for less gain. They can be used interchangeably, and no one would notice. Except maybe the band when you disappear just a bit in the mix with the Bad Angel compared to the Rat. The extra bass gives it a bit less attack when picking, more give and less bite I’d say. It’s a great alternative if you wish for just a bit more open sound and less tin can with the Rat. More 90s hard rock and less 80s metal. The less gain mode is nicer for rolling back the guitar volume and strumming or finger picking, or jamming some blues. I dig it. Thanks for this and all of your reviews. I’ve been digging the site for years. It might not be the right place to ask you that question but I hope you’ll answer me :). What do you think about small pedals from Hotone Skyline Series ? I know they try to copy some great pedal but I don’t have correspondance for each one. Thank you so much for this amazing website ! I haven’t tried all of them, so I can’t say whether they’re all good but the Grass (Tube Screamer) and Blues (Boss BD2) are pretty nice. I also liked the Roto, which although not one of the best UniVibes I’ve tried, had some really cool sounds. You think the bad angel is indicated for the sound of the solos of songs like Rattle that Lock or Dancing right in front of me? Or a pedal like the Xotic SL Drive would be better? some advice? I have a t20 hd Hiwatt that i use with a cabinet with Celestion speaker 1×12.. my guitar is a custom squier classic vibe stratocaster with cs69 (neck and middle) and ssl-5 (bridge).. something similar to a personal gilmour replica.. at the moment i use the wampler plexi drive for this kind of tones but I’d rather use the plexi like a boost or really low gain and want to try something else for that tones.. any suggestion? and congratulations for the immense work you do!! The Buffalo FX TD-X would go nicely with that setup. Cranked, it will provide some creamy distortion tones. The Bad Angel would work as well, although it has a considerably darker tone, compared to the TD-X. Hi! can you compare this pedal to the Costalab Custom muff? That’s a Big Muff loosely based on the triangle era model. The Bad Angel is closer to a Rat and that amp-like distortion. A week without Bjorn? Busy recording? I hope you’re okay!!!! I just don’t remember an entire week without seeing more posts, or replies, so being a worrier, I worry! Haha. Please say hello when you get a minute! Nice sounding pedal and versatile imho, plus a very cool look. Just as you said, I would prefer another stomp switch to activate the saint-sinner mode. If they manage to release a modified version with that improvement, I’ll definitely give it a try! I’m always looking for good overdrive pedals, as I have hard times to set my Mooer Blues Mood and my Vick Audio 73 ram’s head together. They sound muddy, without any frequency definition, I have to use another clean boost/drive (a Danelectro Transparent Overdrive) specifically for the ram’s head in order to have a good sound with it. So my Blues Mood is only paired with a Mooer Black Secret when I want a high gain effect. Maybe the problem just come from contradictory tone settings from the two pedals, I don’t really know. Do you have any tips about it? What amp are you using? What mid range mode on the Ram’s Head are you using? A muddy and dark tone is often the result of too much gain and mid range. I just read your new article about tone and I’ll try to put into practice your advices. I also re-read your article about amps to look for tips about settings. My amp is a Bugera V22 with the following settings: clean 5, volume 7, bass 4-5, mid 5, treble 4, master depends on how loud I can play at home, presence 5. I also used to play with mid boost section engaged but I don’t know if it’s a good idea. On the ram’s head I use the scooped mode, as I found the other modes to be worse (in this case, but the pedal on its own stands wonderful and I love how it sounds). I couldn’t tell you about the settings, because I regularly change them to find the sweetspot, but I usually manage to avoid too high sustain setting. What are your usual settings on it? My Mooer Blues Mood is set on mode Fat, level 9:00, tone 12:00, gain 1:30. Maybe there’s too much gain as you said. I’d switch off the boost and maybe tame the gain on both the Muff and BD2 to better match each other. I think it’s more a matter of finding the sweetspot between the amp and pedals. Depends on what amp you have but the Rattler and Bad Angel are similar and probably the best choice if you’re struggling to get that smooth sustain. I’ve been having a lot of trouble with my inner rars getting stopped up lately, so my hearing is off a bit, but from what I can tell, it sounds pretty much as described, and I especially liked the last cranked bit on “Hey You” I think that it would give the Reeves that push into Marshallish territory that I miss, or I could get a Marshall, and an AB switch! I think this pedal may be a bit more affordable though, and may be enough to satisfy my high gain, smooth, and compressed tones I miss having at my disposal. Although for recording, my little Ibanez head was almost indistinguishable when AB’d with a 70’s Plexi, but at 15 watts I definitely need something else on stage for that tone. I’ll have to give it another listen once this bout of allergy driven deafness subsides. As usual, another great Gilmourish review, thanks for your time and effort! Without being too graphic, it seems that blood had somehow gotten into my middle ear, and dried up, but with many, many saline rinses, it broke down, and my ears suddenly just opened to almost 100% yesterday afternoon. I’m going to test to see if my almost perfect pitch has returned as soon as the rest of the house leaves for work this morning. I thought my days of playing were over,( deafness is common in later adulthood on my dad’s side. ), but I think that at least for now, I will hear to play again. Prior to the onset of this problem, I never thought about my hearing, but became certain that I’d permanently damaged my hearing by standing in front of fully cranked Marahalls for 30 years. For God’s sake protect your ears all you guys and gals, you can’t imagine the awful psychological effect this had on me, I was more depressed than I’d ever been, and I will now, and forever be proactive in protecting my hearing!!! PEACE, AND MAY YOU ALL BE BLESSED WITH GOOD HEALTH, AND HAPPINESS!